Recent recruit Martins Susters admits he is delighted to be back at Planet Ice for a second time. The Latvian-born talent emerged from the Peterborough junior system to feature in their English Premier League play-offs triumph of 2015. His first spell as a Phantoms player ended under something of a cloud in early 2016 as rumours surfaced of a fall-out with head coach Slava Koulikov and Susters has since played in his native Latvia before returning to British shores for the current campaign. 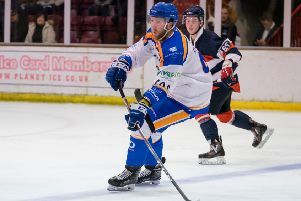 He initially signed for Invicta but was snapped up by Phantoms last week after leaving the basement side and he marked his return with a goal in the club’s 4-3 success against Swindon in the opening leg of their NIHL Autumn Cup semi-final. And the chance to challenge for silverware is what enticed Susters back to Bretton. He said: “What happened in the past stays in the past. It’s just life, everyone has moved on and it’s great to be back. “I wasn’t really happy at my last club and had to make a decision to move on. It was a no-brainer to come back to Peterborough when the chance came up. “It was great to go straight into important games last weekend and it struck me straight away how big the bond is in the team. Susters was left with a nasty wound to a finger after being caught by a slash during the victory against Basingstoke last Sunday, but he is expected to be fit to face Swindon tomorrow.